The event will present the annual project “Dumaidan-2017: Getting Together around the Tent of Understanding”. This year the aim of the project is to determine causes of misunderstanding between people from different ethnic groups in Ukrainian society and search for their prevention. The first dumaidan within the annual project “Dumaidan-2017: Getting Together around the Tent of Understanding” within the Docudays UA International Documentary Film Festival will be held in Kyiv on March 30, 2017, in the Cinema House [Budynok Kino] at 6 Saksahanskoho Str. The event will last from 16.00 to 19.00 in the White Hall [Bila Zala]. 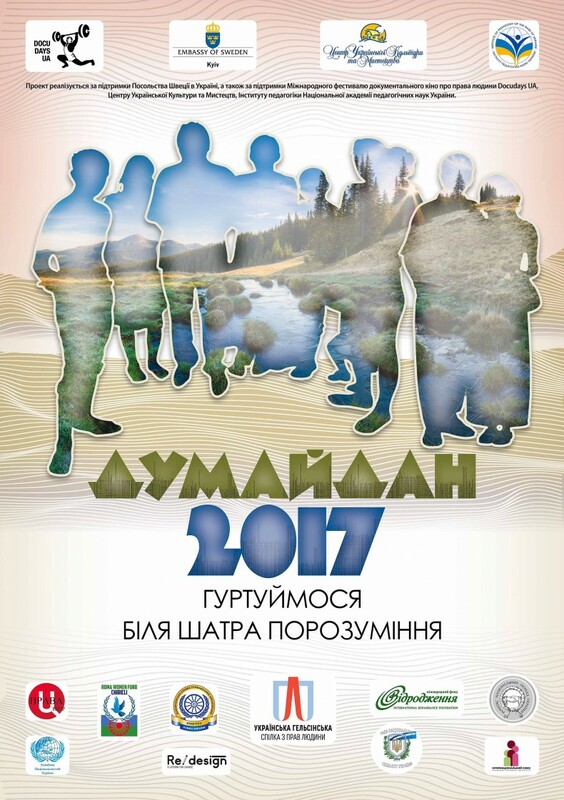 During the event, the annual project “Dumaidan-2017: Getting Together around the Tent of Understanding” will be presented. This year the aim of the project is to determine the causes of misunderstanding between people with different ethnic and cultural backgrounds in Ukrainian society and to find ways to address them. During the event, the working text of the resolution of the first members of dumaidan based on presentations and discussions will be drafted; a competition for the best essay to address the issues will be announced. The first dumaidan guests can join the discussion and learn more about the history of Roma people, including such its tragic moments, as the Nazi genocide during World War II. Attendees can also view the teaser of the documentary art project about the history of modern Ukrainian Roma women, who destroy stereotypes and by their example demonstrate success, professional and personal realization. The first dumaidan will begin the annual debate and the search for answers to the question: how can we, people from different ethnic groups and different cultural backgrounds, build intercultural dialogue and become closer to each other? At the end of the event, there will be a so-called free microphone for the guests of the event and an informal discussion over a cup of tea! Organizers of the project “Dumaidan – 2017: Getting Together around the Tent of Understanding” are the Ukrainian Helsinki Human Rights Union, the Ukraine-wide Union of NGOs “Congress of Roma of Ukraine”, the International Renaissance Foundation, the ICF Roma Women Fund “Chirikli”, the NGO Platform for change “Re:Design”, the Congress of Ethnic Communities of Ukraine, the Council of National Communities of Ukraine, the NGO “Center of Law”, the International Civic Organization “International Union”. The project is supported by the Docudays UA International Human Rights Documentary Film Festival, the Center for Ukrainian Culture and Arts, the Institute of Pedagogical Science of the National Academy of Pedagogical Sciences of Ukraine. The event was organized as part of the UHHRU project on institutional development, funded by the Embassy of Sweden in Ukraine and supported by the Docudays UA International Human Rights Documentary Film Festival. Contact: Olena Sapozhnikova, Tel . :+38 063 8566022.